My friend Ralph taught me how to do a Fishbone Analysis recently (it had been invented by Dr. Kaoru Ishikawa). You can use the Fishbone process to help you figure out how to best achieve an objective, including how to prioritize the individual items which together are needed to meet your objective. Let’s say that you determine that you need to grow the number of visits to a Web site/page from 500 per month to 20,000 per month by year-end. First, you go through the six things that prevent you from getting that objective done. These are called the six “M’s” because each starts with the letter “M” to make it easier to remember. Minutes — The time you need. Now, it’s called a fishbone because you draw a line (the fish’s spine) with three diagonal lines on each side (which look like bones) and it looks like a fish (see my sloppy image above). 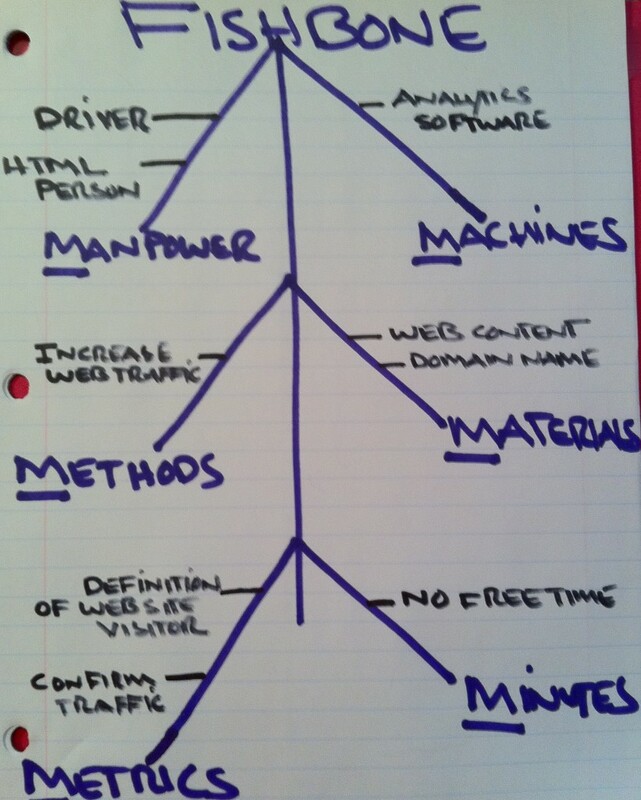 So, back to the Fishbone example of getting your traffic to 20,000 visits per month. Go through the six “M” categories and for each one answer the question: “What things within each category are preventing me from getting to my goal (e.g. to 20,000 Web site visits per month). You need access to someone familiar with HTML. You need to know the definition of a Web site visit. You need analytics software to measure Web site traffic. You need content on your Web site to attract visitors. You need to figure out if the Internet domain name you’re using is the right one. The key people who would work on this project don’t have any free time. You then take each of the sub-items (in my case I made it simple and there are only 9 (usually you’d have 20 to 30) and list them out and do a Fishbone Ranking of them. 25 = You need to know the definition of a Web site visit. 23 = You need analytics software to measure Web site traffic. 19 = You need to figure out if the Internet domain name you’re using is the right one. 16 = You need access to someone familiar with HTML. 13 = You need content on your Web site to attract visitors. And, voila, this may be the order you need to do those items. For those who really like fishbone brainstorming, you can take any of those individual items and do an entire new fishbone JUST on that item. If you like this article, you will probably also like this article I wrote on the SWOT Analysis tool. Good article…especially like the concept of ranking explained here. Good article. I agree with Neha, you need to have a diagram for the visual readers. Xmind is great tool to conduct such an analysis and best of all, it’s free! What is the first team activity to prepare a fishbone ? I’m not sure exacty what you mean, Asha, but my best answer is that your first activity to prepare for a fishbone should be for your team to identify an objective of yours that you would like to increase your success at achieving. Write back if that doesn’t answer your question. Otherwise, best of luck! I finally added a simple hand-drawn diagram, Neha. Hope you enjoy it.